New home for FSharp.Charting library was announced. A new page with the F# videos became available of fsharp.org. MS Press published: F# for C# Developers. Put up some simple docs for the lazy Matlab Type Provider. Updated F# source code formatter (Fantomas) is on NuGet – now with support for formatting selection. 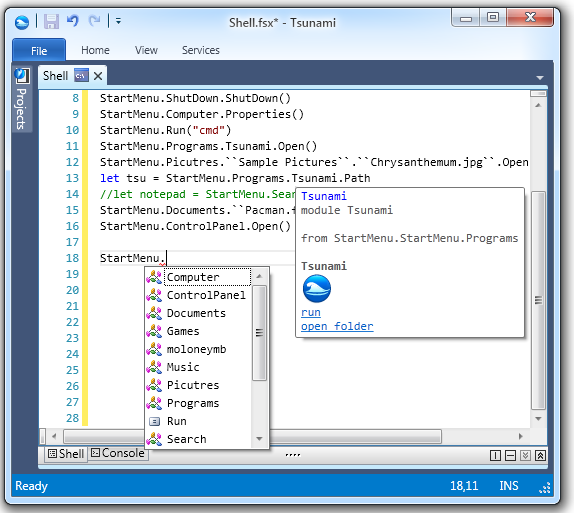 Tsunami brings back the Win8 Start Menu as a Type Provider. We would recommend F# as an additional tool in the kit of any company building software on the .NET stack. WANTED: F# binding for Light Table. “Data Science with Hive from Tsunami” by Tsunami IDE. “Build Data-Rich Solutions Faster with Microsoft Visual F#” by Dustin Campbell. Richard Broida blogged “WATK in F#, Part 4: Introduction to Cloud Services“. Richard Broida blogged “WATK in F#, Part 5: Background Processing with Worker Roles and Queues“. John Liao wrote “Riak MapReduce with F#“. Santi Albo shared “Monads in F#“. Martin Trojer shared “Comparing FP REPL Sessions“. Ash presented “Tilde, a static blog generator“. Martin Trojer blogged “Scheme in Scala“. Dave Thomas posted “Monster Zero – Revisited“. Anton Tayanovskyy shared “Generic programming in F# – another take“. Andras Janko wrote about “jQuery Mobile page reuse with Websharper“. Christoph Ruegg blogged “Test Your C# or F# Library on Mono With Vagrant“. Tomas Petricek published “New home for F# Chart“. These weekly reports are appreciated. Keep it up!